Yuka Satou is an ordinary girls, she study in an all girls school. She suddenly got a big brother because her father decided to married again. She expect to have a mature, calm and cool brother because her step mother is a calm, mature and good looking woman, but what she got is the opposite from what she expect beside for the good looking. 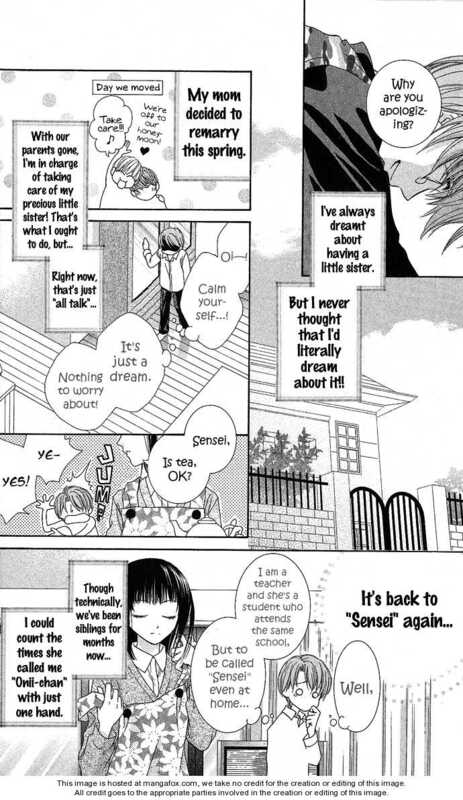 Taichi Satou is not only an uncool, childish, brother but he also has acute level of sister complex. He has been dreaming to has a sister since he was a kid, when his dream finally granted he felt really happy and he wants to stay together forever with his sister ( yuka ). what makes worse is their parent went to the journey around the world as their honeymoon, so Yuka and Taichi have to live together in their new house, but their parent haven’t registered their married, it’s mean that they are not brother and sister yet. Taichi always do something to make Yuka happy, so she will call him “oniichan”, in Taichi eyes, Yuka is the cutest and most beautiful girl it makes Taichi over react to anything related to Yuka , and Yuka will react calm (coldly) to everything Taichi does. when Yuka think “thank god it is only in the home”, it turn out that Taichi is replacing one of the teacher in Yuka’s school. And it means that Yuka life will be funny, and full of tear ( Taichi’s tears of course ), and most of the student likes to tease him because of his sister complex, and they have to keep secret that they aren’t sibling from everyone.